The developers of Ark: Survival Evolved, Mount & Blade, Star Citizen, and more are on board. 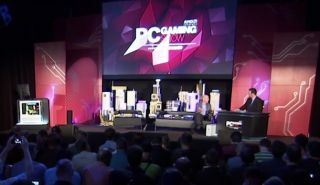 The PC Gaming Show is returning for 2016, and we've got four new partners joining us for the festivities: Star Citizen studio Cloud Imperium, Studio Wildcard of Ark: Survival Evolved, Mount & Blade developer TaleWorlds Entertainment, and Torn Banner Studios, which is currently working on a new project called Mirage: Arcane Warfare. They'll be taking the stage alongside previously-announced partners Bohemia Interactive, Relic Entertainment, and Tripwire Interactive in this year's edition of the PC Gaming Show. Featuring a refined format, this year's event will include new announcements, first-looks, exclusive content, and chats with a few legends of PC gaming. More participants will be announced in the coming weeks. The 2016 PC Gaming Show will be streamed on Twitch as part of its “Day Zero” E3 coverage, beginning at 11:30 am Pacific on June 13. Pre-show coverage, featuring a behind-the-scenes look, will begin at 10:30 am, and we'll also be hosting a post-show livestream that will include exclusive interviews with many of the show's guests. Hit up PCGamingShow.com to find out more. Did you miss last year's show? Catch the whole thing here.